Nice 80's feleling. 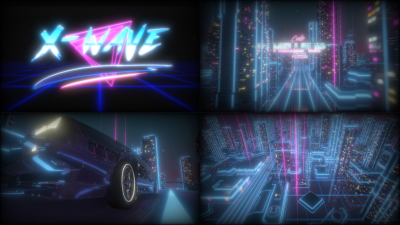 Seems highly inspirated from retrowave by Florian Renner even for the title. Well done but please give credits next time. Super cool, very "outrun" styled. The music fits very well and the lead synths gives it the additional "noir" overtones the style needs. Just a minor thing: the car wheels don't seem to spin in some closeup shots. The 80's VHS style perfectly recreated, a very fitting music, a delorean, and the demo itself fitted to the demoparty's theme... to be continued ? I want to see the rest !!! Look super promising . I wish you guys could do more. viasually rocks! i love some of the polyphonies, very jarre-eskish. great music doh! Well-executed rendition of an aesthetic that is a bit overdone by now. You're right Ok3anos ! We talked about that during the party, but totally forgot to credit Florian Renner. Thank you to remind us this important information ! I just added his name in the youtube video description and we are updating the nfo contained in the zip file. Not bad at all! The "synthwave" isn't my thing at all, but this is quite completently mad, if a bit underdeveloped. The music at least def could use a bit more punch. ~15fps, weak music dunked in reverb (and I actually kinda like synthwave), one scene. Crashes here during loading. Windows 7 + GTX 1060. Looks yummy. Waiting vor final. Ok now it works. Looks shiny and all but left me cold. Maybe the scanlines should be under the bloom blur? The music at least def could use a bit more punch. I don't like to over compress my music just to follow the actual fashion and loose all dynamics. Doh always delivers, lovely sounds. Ironcally, I think it could use a lot more neon. Tron meets Miami Vice :). Nice one. I am a sucker for the theme of this demo! Keep on creating demos X-men! Pretty even though choppy on my ancient box. Very solid work on the overall mood. Fine retro aesthetic if one is into that thing, but come on now. One flyby scene, 2D graphics ripped from the retro wave generator, bland music, worse VHS overlay effects than what we saw over a decade ago (X-Mix 2004 anyone?) .. Sorry, no. Even if not fully "original", I really like the result ! Best 80's retro-lazer design execution i've seen in a demo. Started with nice scenes but lacks variety. To be continued it says. rulez added on the 2017-06-19 22:51:11 by ɧ4ɾɗվ. Great design! Car looks ace. Music sounds authentic. I like the pitchbend detail in the lead. page created in 0.018822 seconds with 15 queries.